You could never argue in a sane world that £1,800 is anything but a lot of money. However, when a lot of top-end, pre-built gaming PCs can be way over the £2,000 mark, a gaming rig that promises a no-compromises gaming experience for £1,800 suddenly looks a lot more like reasonable value. The Boss-X is certainly an imposing machine on paper, and it's equally impressive in the flesh thanks to the huge Cooler Master HAF X chassis in which it is enclosed. The 'HAF' in the name stands for High Air Flow, and as you'd expect, a lot of the space inside the chassis is dedicated to maximising the air flow to keep the components as cool as possible. This design is helped along by four large (yet surprisingly quiet) fans, with plenty of space for additional ones. A dedicated air duct pipes cooling air to the graphics card as well. This is great for those who want to get their grubby little overclocking mitts on the technology here. It's also handy because Vibox has kindly overclocked the Intel Core i7-3770K to 4.50GHz. A Corsair Hydro H80 Water Cooler keeps the processor cool and quiet, though the chassis fans mean a little background noise remains. This is clearly a no-holds barred gaming system, sporting a glowing red LED fan at the front of the chassis and a large Perspex window at the side to show off the impressive hardware within. The front panel boasts a pair of USB 3.0 ports, along with eSata, FireWire and two USB 2.0 ports, plus the obligatory microphone and headphone connectors. When you're looking to plonk near £2,000 down on a gaming rig, you want to be sure it has the necessary graphical grunt. The Vibox Boss-X comes with a single Palit GeForce GTX 680 2GB, so no SLI goodness here, but perhaps that's the sacrifice you make for keeping the asking price below two grand. Still, it's certainly no slouch when it comes to gaming, with the GTX 680 remaining a great single-card GPU. 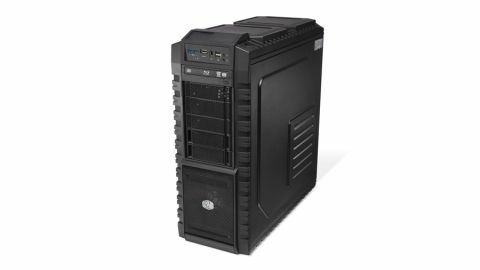 Of course, this isn't as future-proof as some of the high-end systems we've seen, but the roomy chassis does mean there's plenty of scope to add extra components when the time comes to upgrade. You'll be safe to put your wallet away for a good while yet, though. Windows 7 Home Premium is housed on a speedy Corsair 240GB Force 3 SSD. In the AS SSD benchmark, the drive hit 505.44MB/s sequential read and 306.76MB/s sequential write speeds. Booting up from cold got us into Windows in a sprightly 30.5 seconds. Windows 8's love affair with UEFI means we should see even faster bootup times with the new operating system, and Vibox is offering an upgrade to Windows 8 for just £15 for any PC bought since May. The 240GB SSD is great for installing your most used apps and games to take advantage of the solid state's extra speed, while a 2TB HDD offers more than enough space for everything else.